Alex Ho’s Mother Doesn’t Want Jinny Ng to Marry Her Son? In April, 25-year-old Jinny Ng (吳若希) and her boyfriend, Macau’s rich 2G Alex Ho (何兆鴻), welcomed their baby girl Giselle. Though it’s already been two months since Giselle’s birth, rumors of an eventual union between the pair have been nonexistent. In fact, it’s going the opposite. Though Jinny now has the ticket to marry into a rich family, no everyone in Alex’s family is on board with the idea. 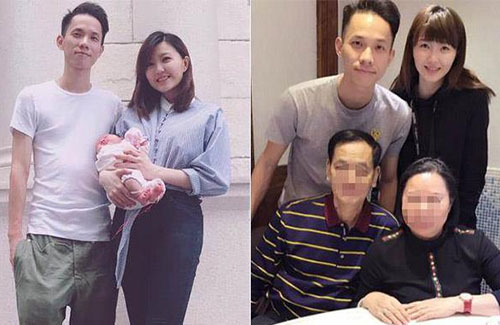 Hong Kong paparazzi are reporting that Alex’s mother has been actively preventing Jinny to marry into the family, as she prefers Alex to marry a woman who would be willing to stay at home to take care of the kids. Some gossip sources are even suggesting that Alex’s mother had prevented Jinny from seeing her daughter. 3 comments to Alex Ho’s Mother Doesn’t Want Jinny Ng to Marry Her Son? so pitiful…gave birth to a daughter but no signs of getting a status. I wonder if the baby is a boy, there would be immediate marriage? @itsmeg i think it will be worse…the guy’s parents would want the child but not the mother. isabella leong is left to look after 3 boys by herself.